Queensbridge Houses is the largest public housing development in North America. It is located in Long Island City in Queens , and opened in 1939. The 3,142-unit complex is owned by the New York City Housing Authority. The complex is located in Community Board 1. Although the Queensbridge Houses house approximately 6,907 people it is technically two separate complexes (North and South Houses) consisting of roughly 3,450 each. Long Island City is located in the northwestern part of the New York City borough of Queens, with Newtown Creek and East River waterfronts. 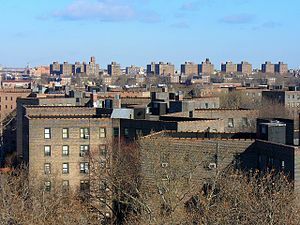 The Queensbridge Houses, the largest of Queens' twenty-two developments, is located between Vernon Boulevard (which runs along the East River) and 21st Street, immediately south of Transcanada's Ravenswood power plant. Queensbridge gets its name from the Queensboro Bridge , which is just south of the complex. The development is separated into two complexes, the North Houses on 40th Avenue and the South Houses on 41st Avenue. Subway commuters will recognize the complex's name from its 21st Street–Queensbridge station along the IND 63rd Street Line ( ). The entrance to the station is on the eastern side of the complex on 21st Street. The 96-unit six-story buildings are distinctive due to their shape - two Y's connecting at the base. This shape was used as the architects hoped it would give residents more access to sunlight than the traditional cross-shape. The design was said to be cost-efficient, and they reduced the cost even further by using elevators that only stopped at the 1st, 3rd and 5th floors. Political pressure to keep costs down was a key reason for the use of cheap designs. W.F.R Ballard, Henry S. Churchill, Frederick G. Frost and Burnett Turner designed Queensbridge Houses. Access to buildings in the complex is by key or via a new intercom system. The halls of Queensbridge’s buildings are comparable to most municipal buildings, and are dilapidated and lined with worn light blue tiles. Apartments are painted white and are fairly small, even by New York City standards. During the 1950s, the management changed the racial balance of Queensbridge by transferring all families whose income was more than $3,000/year, a majority of whom were Caucasian, to middle-income housing projects, and replacing most of these tenants with African American and Latino families. In addition to providing safe and sanitary housing to many low income African American and Latino families, this policy also promulgated racial segregation in public housing. As a result of the 1937 Wagner Housing Act, Congress would only approve funds for public housing if the housing was unattractive to middle-class families who would otherwise buy or rent homes in the private housing market. The original plans nonetheless included some basic amenities, like a central shopping center, a nursery and six inner courtyards for play. In the 1950s, there were also three playschool rooms, a library, a community center with an auditorium where shows were put on, a gymnasium with a wooden floor that doubled as a wooden-wheels roller skating rink, activity rooms downstairs, and a cafeteria upstairs where the playschool children ate their lunches. Some of the downstairs activities included tap dancing, ballet, art, playing the recorder and singing, pool, knock hockey and table tennis, as well as Girl Scout and Boy Scout meetings. Residents enjoyed concerts during the hot summer months in the square central shopping area, and the Fresh Air Fund sent under-privileged youth out to the Peekskill mountains to release them from the crime and grit plagued streets. The buildings in the complex are divided by a series of paths and small lawns. Also in the complex are several basketball courts and play areas lined with benches. Across Vernon Boulevard lies Queensbridge Park, which has a fully-lit baseball diamond, running paths, lawns and areas for picnicking. That park, home to the Queensbridge Little League, is the primary place of recreation for tenants of the project. Queensbridge Park is the venue for numerous summer-time live concerts with music ranging from R&B to Latin. During the 1950s and up through 1970 Queensbridge Park was called "River Park," after the East River that runs next to it. There was also a smaller park placed conveniently right under the 59th street bridge called "Baby Park". Baby Park was closed due to debris falling from the bridge during maintenance work which is ongoing in 2007. Baby Park was replaced by a new playground for same age range between 40-41 Avenues within Queensbridge Park itself. Queensbridge has historically proved to be a hotbed of hip hop musical talent. Famed producer Marlon “Marley Marl” Williams was the first in a long succession of acclaimed artists from “The Bridge”, which became one of the most prolific hip hop-producing neighborhoods in the country. Marley's Juice Crew collective, hugely influential in the 1980s, featured among its members Queensbridge rappers MC Shan, Roxanne Shanté, and Craig G, each noted names in their own right. Most notable of today's Queensbridge hip hop artists is the acclaimed rapper Nas, who has since the 1990s frequently used his music and lyricism to reference Queensbridge and its hip hop history. Other noted artists associated with Queensbridge include Prodigy and Havoc of Mobb Deep, Cormega, Tragedy Khadafi, Nature, Screwball, Capone-N-Noreaga and Big Noyd. At a time when you can buy screwed & chopped albums at Circuit City in Brooklyn, it’s easy to lose sight of the fact that hip-hop was once a local phenomenon. More than just a voice of the ghetto, hip-hop at its best is the voice of specific blocks, capturing the distinct tone and timbre of an artist’s environment. Since the 1980s, New York City’s Queensbridge Housing Projects has been documented perhaps better than any other geographic location. Starting with super producer Marley Marl’s dominant Juice Crew in the ’80s all the way through ’90s mainstays like Nas, Cormega and Capone, the Bridge has produced the highest per-capita talent of any ’hood. On February 4th, 2009, more than 50 people ranging from 17-68 years old in the Queensbridge Houses were arrested on various charges including distribution of narcotics and firearm trafficking. “Queensbridge, New York, N.Y.,” Architectural Forum 72 (Jan. 1940), pp. 13-15. Samantha Henry, “A Good Rap: Residents of the Queensbridge Houses Make Their Claim To Fame,” Newsday, August 5, 2001. Ron Artest: The Next MC Outta Queensbridge? Gail Radford, “The Federal Government and Housing During the Great Depression” in John F. Bauman, ed., From Tenements to the *Taylor Homes: In Search of an Urban Housing Policy in Twentieth Century America (University Park, Pennsylvania: Pennsylvania State University Press, 2000), pp. 102-120.